In the last 5 months, volunteers from all the various groups and organizations that come together under the name of the FNRP, have gone to villages, departments, neighbourhoods, cities, parks and door-to-door all over country to educate the Honduran people about the NCA and to collect the signatures. Despite widespread repression, murders and torturing by death squads of resistance members, day-to-day the collection occurred. Given the severe repression, the FNRP reports that many were reluctant to give their signature for fear that they would later be identified and then threatened or killed for participating in the process. COPINH reports that their efforts in the collection are “a tribute to the martyrs of the Honduran society in the struggle for the refoundation of Honduras.” COPINH also denounced that it was not an easy mission as many of the volunteer members of the organization were detained, repressed, threatened and jailed during the process. At one point, police even tried to confiscate papers containing signatures that COPINH had collected. The very day President Manuel Zelaya was overthrown on Sunday, June 28, 2009, Hondurans were going to participate in a non-binding, national opinion poll as to whether they supported including a question on the ballot, during the November 2009 elections, concerning the formal establishment of a National Constituent Assembly. Along with electing their president, congressman and mayor, people would have indicated – in a 4th ballot – whether or not they were in favour of a National Constituent Assembly. The opinion poll and the hopes and rights of the Honduran people were crushed that day by the military coup, an attempt by the oligarchy to stop a process that would challenge their power and position in Honduran society. 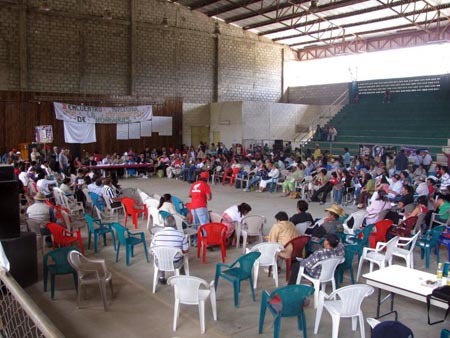 Recognizing that the Congress and Supreme Court, the oligarchy and the two dominant political parties would never permit nor support a process that would give the majority of Honduras a voice in the political, social and economic processes of the country, the FNRP announced their commitment to the campaign and began to gather signatures to demand the Assembly in July 2010. In Honduras, Wednesday, 15th of September will not just be like any Independence Day marked by the typical Central American-wide celebrations with firecrackers, marching bands and parades that will mark 189 years of “independence” from Spain. This Wednesday, the resistance movement will participate in the celebration of the hard work carried out to gather the 1.26 million signatures and the end of the collection campaign. Although it is still to be announced, the FNRP are planning to present the signatures to national and international institutions to continue in their struggle for the Constituent National Assembly. COPINH has proposed that ex-President Zelaya, the elected coordinator of the FNRP, present the signatures to international institutions including the United Nations, ALBA (Bolivarian Alliance for the People’s of the Americas), UNASUR (Union of South American Countries) and SICA (Central American Integration System). Stay tuned; stay involved. The amazing pro-democracy people’s movement in Honduras can use all the support they can get as they march resolutely forward.